Nootropil Review: Old but Gold? A Staple in Nootropic Stacks. Nootropil is actually one of the oldest – if not the oldest – nootropics that were ever available out there. It’s made of piracetam, a 50-year old nootropic. While that might make it seem outdated to some, it actually still works quite well, and when you consider the fact that it’s had fifty years worth of research backing it already, you might understand why. Despite the rise of the many modern nootropics now available everywhere, the fact that it’s still available and for sale to this very day should be a sign and a testament to its prevalence. To many, it will always be Adderall, but to a select minority, Nootropil is the way to go. 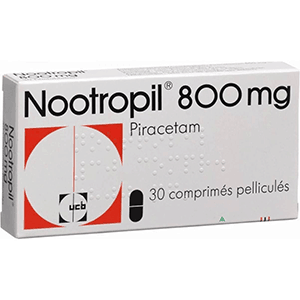 Yep, Nootropil actually only has one ingredient – piracetam. While that might also seem like a very low number, it works. Piracetam has been around for a long time, and although admittedly, there have been newer racetams that work a lot better, such as aniracetam, piracetam still holds on strong. It provides healthy nutrition to the brain, as well increased blood flow that allow its users a slightly different feeling of focus as to what most would feel today. In addition, consider that it’s a 500-1000mg pill of purely one ingredient – now that’s what you call potent. Nootropil’s piracetams still do have some drawbacks now, though. Its old age does show signs, but it’s not as bad as you would expect. Firstly, you need to stack your piracetam with a form of choline, otherwise you might experience headaches; and secondly, it might not be as effective as aniracetam and newer racetams. Despite this, Nootropil will definitely stay a staple in nootropic stacks as one of the base nootropic ingredients. Most of the people who opt out of pre-stacked formulas and would like to stack on their own will almost always have Nootropil or a form of piracetam in that stack. Despite its age and the many other newer brain pills out there, Nootropil can still hold on its own. It’s been backed by countless studies, and is still potent in today’s standards. While we did say that it’s a staple in any nootropic stack, you can actually also stack this with pre-stacked nootropics and get great results. Nootropil might be old, but it may take another fifty years before it’s completely phased out.